Forget January. 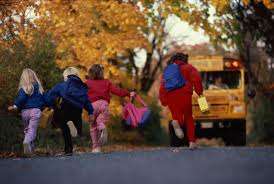 September is when everything starts anew when you have school aged children! reality is most are in scramble mode, throwing lunches together, searching for permission forms, breaking up arguments and causing the children to eat breakfast in the car. Every September we vow that this is the year we are going to achieve the perfect back to school morning! Routine, Routine, Routine! That is the secret! Kids thrive on routine and parent can relish in routine. Bedtime should be as consistent as wake up time. When everyone arrives home from school, everything from homework to permission forms to library books goes in one place and things like hats, mittens, jackets are hung up in their place. This way nothing goes astray. Responsibilities. Share them! Kids love to help! They can handle picking out clothes, emptying the dishwasher, packing up their backpacks, taking their vitamins, setting out the lunch containers and filling water bottles. Reminders. Get some poster board, colourful markets and talk with the kids about what needs to get done each morning. : get dressed, brush hair, brush teeth, homework/library books, vitamins, pack backpack, empty dishwasher, etc. Then post this list of reminders on the hall closet door. When kids are not sure what to do next, they know where to go to make sure they have completed everything. Add in stickers or a check list for the really young ones so they feel like they are accomplishing something. Recipe. Make a commitment to yourself and your kids that is year you will strive to make at least one homemade snack. Get the kids to help. A double batch of oatmeal applesauce cookies and a loaf of whole wheat banana bread take just an hour to make and will get you through at least two weeks of school snacks. Store in the freezer cut up and ready to pack in lunch containers on school mornings. math class will still happen and tomorrow is another chance to try it again!